The general idea of a photovoltaic (PV) concentrator is to use optics to focus sunlight on a small receiving solar cell (Fig. 1.1); thus, the cell area in the focus of the concentrator can be reduced by the concentration ratio. At the same time the light intensity on the cell is increased by the same ratio. 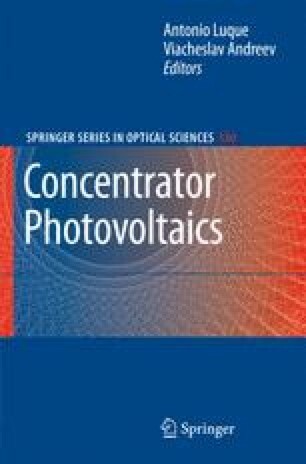 In other words, cell surface is replaced by lens or mirror surface in PV concentrators and the efficiency and price of both determine the optimum configuration. Medium- and high-concentration systems require accurate tracking to maintain the focus of the light on the solar cells as the sun moves throughout the day. This adds extra costs and complexity to the system and also increases the maintenance burden during operation. For systems with small solar cells, or using low concentration, passive cooling (interchange of heat with the surrounding air) is feasible. After 30 years of concentrator development and practically no industrial or commercial activities, the photovoltaic concentration market seems ready to take off and grow rapidly because of feed-in tariff laws approved in several sunny countries and the availability of a sufficient amount of very efficient, up to almost 40%, III-V multijunction cells.